We had a fantastic day on Sunday 14th April, a huge amount of thanks to Richard and Frank at the lock and all the re-enactors, exhibitors, boats and vehicles who all came and made the event the success it was. We had over 17,000 visitors and have had so many lovely comments, thank you for coming. We will be putting up lots of photos on this site soon, so please check back. Please contact us if you have any information on the Upper Thames Patrol, we will be developing a website dedicated to them. Also we do go out and give talks, please see our website www.doingtheirbit.co.uk. 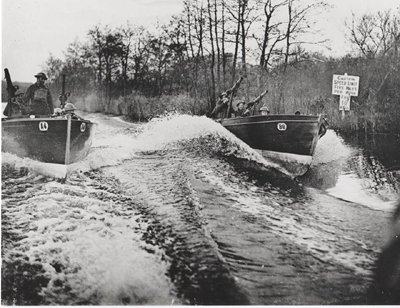 Two UTP slipper launches racing with Lewis guns, possibly downstream of Whitchurch Lock circa 1943. 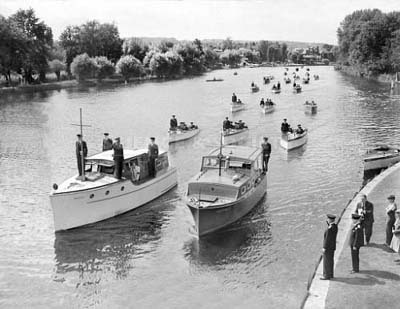 Rear Admiral Sir Basil Brooke taking the salute at Wargrave, near Henley, as he inspected the boats from the UTP 8th April 1940.